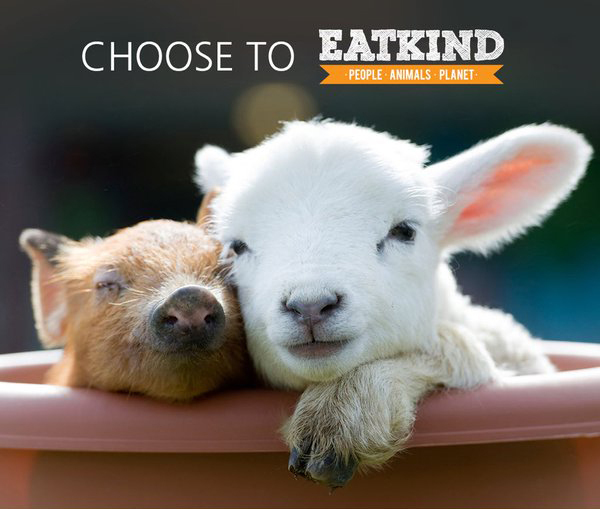 EatKind is a campaign to encourage people to begin their journey to protecting the planet, animals and their health by cutting down, or cutting out, animal products and embracing plant-based foods. As consumers we all have the power to create change. You can stand up for a fairer, kinder food system every time you sit down to eat. Across the globe, millions of people are giving their bodies a boost, helping to spare animals from the misery of confinement in factory farms, and contributing to a more sustainable future by making compassionate eating choices. By reducing or replacing consumption of animal products, they’re helping to create a healthier and more humane world. Will you join the EatKind movement? Act Now: Start by taking the EatKind pledge today! By taking the EatKind pledge you can also choose to receive plant based recipes, news and tips for plant based eating.